Latest Design Option 3-1, Master Bedroom-Bath » Roger Perron Inc. Here we have a master bedroom–bath addition providing elegant living with ambient lighting. 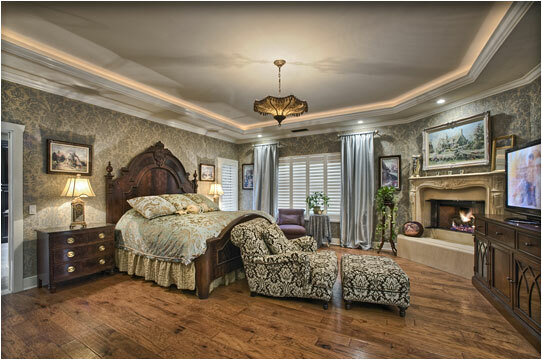 A master bedroom–bath addition provides elegant living. The cozy fireplace and TV create a personalized atmosphere in a traditional setting. The soffit lighting supplies an ambience that feels good and gives a wonderful setting. Crown molding accentuates the ceiling lighting in two locations, and the warm hardwood flooring helps to create the traditional styling in conjunction with the textured wallpaper. Notice the door to the master bathroom.